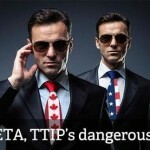 Negotiations on the EU-Canada free-trade deal (CETA) are finished. 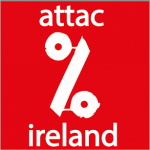 CETA will force the privatisation of public services including water(1). Only ‘non-economic’ services such as street lighting will be protected. 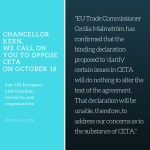 The text of CETA is now available online(2). 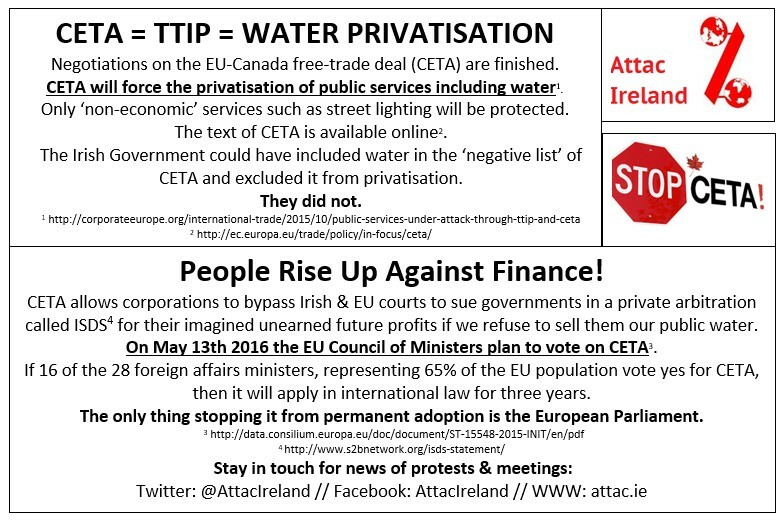 The Irish Government could have included water in the ‘negative list’ of CETA and excluded it from privatisation: they did not. Join us at 1.45pm outside the Gresham Hotel on Saturday 20th February, 2016! 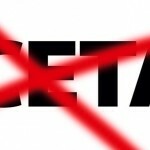 On May 13th the EU Council of Ministers plan to vote on CETA(3). If 16 of the 28 foreign affairs ministers, representing 65% of the EU population vote yes for CETA, then it will apply in international law for three years. The only thing stopping it from permanent adoption is the European Parliament. 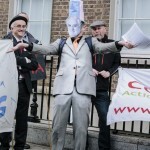 CETA allows foreign corporations to bypass Irish and EU courts to sue governments in a private arbitration called ISDS (4) for all their imagined lost unearned future profits if we refuse to sell them our public water. *If you can’t make it to the meeting but would still like to print out and distribute our fliers please use this image – print it from the file or copy it into a word file and print it – then share widely !